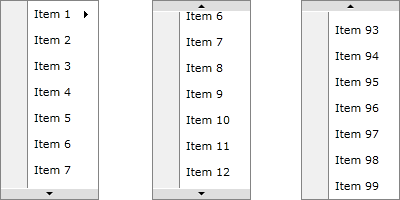 Anytime you implement a RadContextMenu which displays a long list of items, or simply wish to limit the number of items visible in the menu, you can add scrolling functionality to RadContextMenu, and more specifically vertical scrolling. The process to do that is very simple and straightforward. This article will guide you through the process. If you are using RadMenuGroupItem you can control scrolling inside it via ScrollViewer's attached properties - VerticalScrollBarVisibility and HorizontalScrollBarVisibility.